One of my favorite animals is a flatworm, commonly called a planarian. I was first introduced to this creature in seventh grade biology where we sliced them a dozen different ways to demonstrate their ability to regenerate body parts. We managed to produce one individual with two heads and this not only appealed to my love of all things biological; it shared a common thread with some of my favorite monster movies. Planarians require cool, clean water in which to survive. This intermittent stream provides an ideal environment during the winter and spring. Planarians have reached their adult size and are busy producing eggs that will span the dry season this summer. Planarians are most noticeable when they move about on the rock bottom of the stream. Most will hide beneath the rocks during the day and venture out after dark. This one was doing just that until I turned over his rock. They feed on living or dead animal matter and are particularly attracted to red meat. I doubt that they come across many steak dinners. Often, planarians are mistaken for leeches. Leeches normally move by extending the front part of the body and then pulling in the back, like an inchworm. Planarians glide across the substrate on a mass of locomotive cilia located on their ventral surface. Two light sensitive areas appear as eyes atop the wedge shaped head. I haven’t yet identified these planarians to species. One day, when they appear to be particularly abundant, I’ll have to bring a couple inside for closer examination and an attempt at running them through the keys. It looks like the Pileated Woodpeckers have found something of interest inside this dead Tuliptree. The lower part of the trunk is covered with various sized holes. All of this activity has taken place within the last two weeks. There definitely seems to have been some insect activity going on inside the trunk of this tree. There was no sign of any of the architects of this treebound labyrinth. The network of galleries within the dead wood suggests ants. I think it’s remarkable how they can carve out all those tunnels and chambers and still manage to maintain the integrity of the thin walls between the openings. This bug was in one of the chambers, but it was dead, missing a few legs and didn’t have anything to do with the creation of these chambers. It looked like a species of stink bug and seemed remarkably fresh. I found this interesting larva in some debris at the base of the tree. It has nothing to do with the creation of the galleries and is presented here only because I found it to be extremely interesting. The wood it was in was from a large limb that probably fell over a year ago. 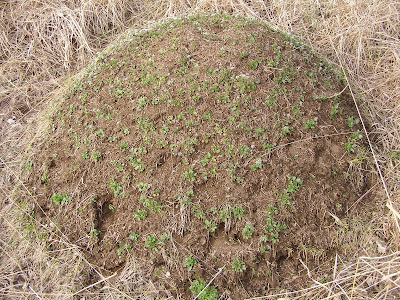 Each spring, many of the ant mounds at Blue Jay Barrens take on a cloak of plants. Most of the plants are annuals that flower and produce seed early in the spring. I haven’t found any evidence that the ants have any special relationship with these plants. 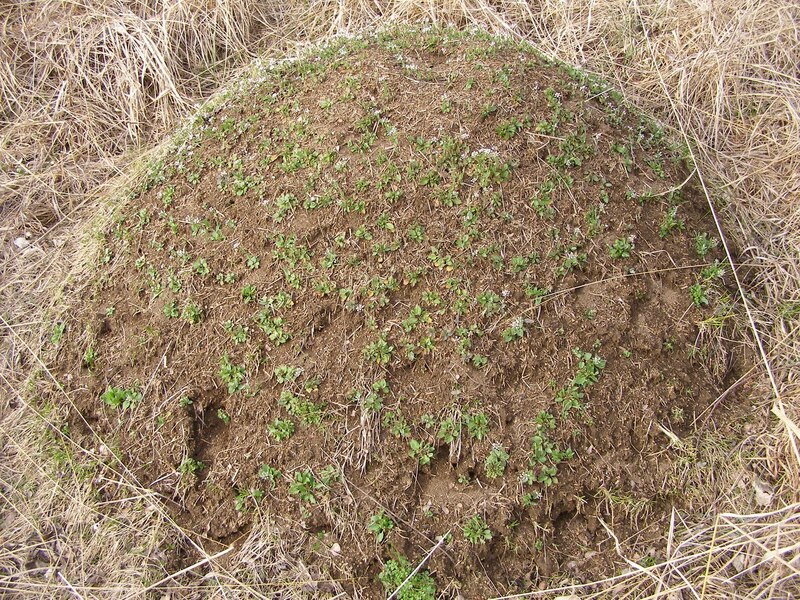 As the ants expand their nest chambers, they bury the plants, but before they are completely buried, the plants mature and scatter a new generation of seeds on the mound. 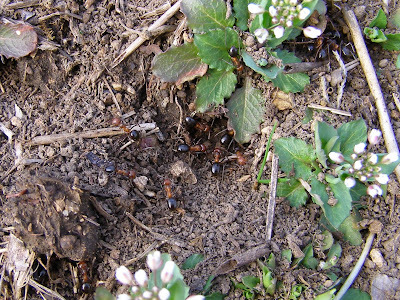 Many annuals colonize disturbed ground. 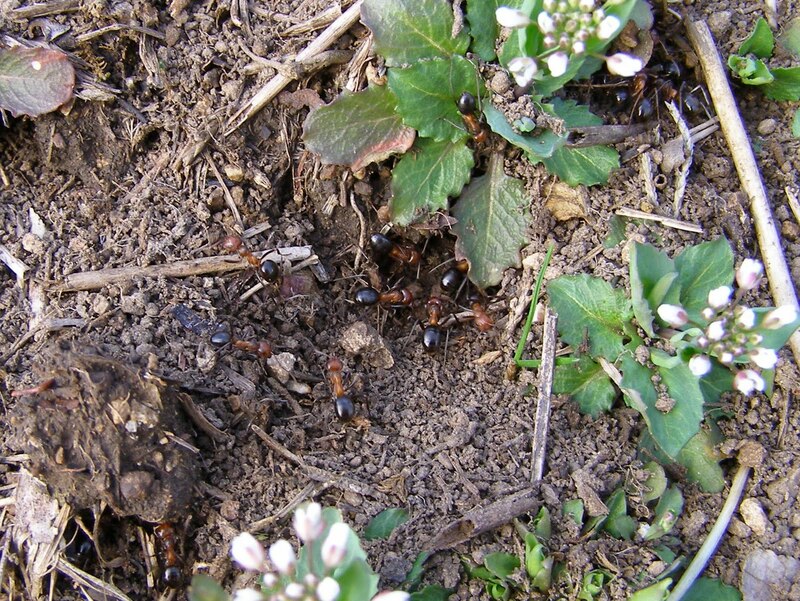 I believe the ants just provide a continuing area of disturbed soil that perfectly suits the needs of the plants. The spacing of the plants almost makes the mound appear to have been professionally landscaped. The plants must also enjoy a certain degree of protection by the ants. Anything unlucky enough to disturbed the plants would quickly be chased away or taken as food. The fallen seeds would also be protected and would benefit by being covered with soil excavated by the ants. The most abundant plant on the mounds is this Perfoliated Pennycress, Thlaspi perfoliatum, a Eurasian species that has established itself across a wide area of North America. Although non-native, this species doesn’t seem to pose a threat to any native plant populations. At least it has the courtesy to display both fruit and flower at the same time, making identification much easier. This is most likely Field Mustard, Brassica rapa, another non-native. This plant also requires disturbed ground in which to grow and is one of the plants responsible for turning broad areas of cropland fields yellow in the spring. Oxeye Daisy, Chrysanthemum leucanthemum, is a non-native perennial that is defined by Ohio law as a noxious weed. This plant is found practically everywhere in Ohio, but the scary part is the fact that Ohio law allows county and township officials to enter onto private property to eradicate noxious weeds. I don’t know of any practical way to begin eliminating this species without also destroying the native plants growing with it and I doubt protecting natives would even be a concern of elected officials. At last, here’s a native plant living on the ant mounds. 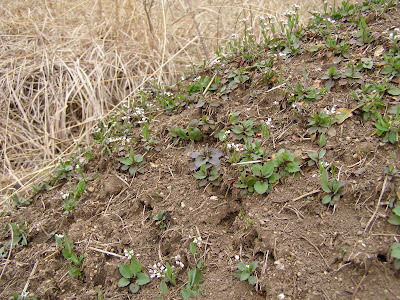 This is Small-flowered Bitter Cress, Cardamine parviflora, another annual that thrives in disturbed soil. There are several native annuals that should thrive on the mounds and I wonder why I don’t see them here. Since my pot cultured Leavenworthia uniflora are promising to produce an abundance of seed, I think I’ll plant a bunch of the seed into one of the ant mounds and see what happens. It sounds like it out to work. Yesterday’s walk in the woods became very exciting when I discovered a species of salamander not seen before at Blue Jay Barrens. 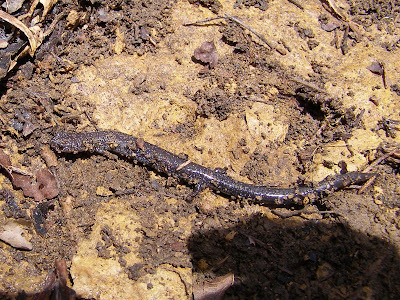 I turned a flat rock and found this Northern Ravine Salamander. This is a species that I’ve never seen before and it took 25 years before I found one here. This just shows that even a well explored piece of property has hidden secrets still awaiting discovery. Northern Ravine Salamanders are completely terrestrial and do not seek out pools of water in which to breed. Eggs are laid in chambers below ground. 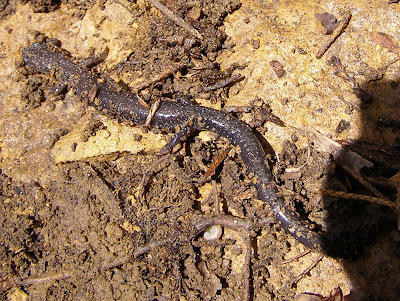 Pool breeding salamanders tend to have a flattened tail that aids in swimming. The Ravine’s tail is round. The toughest thing about uncovering a salamander is getting him back where he belongs without his getting crushed. The first rule of handling salamanders is to make sure your hand is wet when you pick them up. 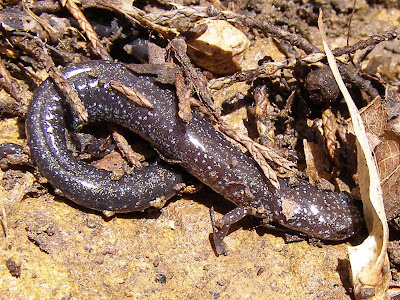 A dry hand can do serious damage to the salamander’s skin. I used my water bottle to wet my hand and then scooped this little guy up while I repositioned his rock. I hurried, because a small salamander can overheat if held for too long in a closed hand. I then put him down and he crawled quickly under the rock. My last act was to pat the soil back up against the side of the rock to keep out the drying breeze. As I was crossing the lawn, I noticed the sod heaving as a mole extended one of its surface tunnels. I decided to pop the mole out of the ground for a few pictures. I stepped on the tunnel about a foot behind the mole to cut off retreat and then ripped the already loosened sod from the end of the tunnel where the mole was trapped. I found no trapped mole, but loose dirt was being pushed up from below. The mole was headed down. He was descending faster than I could dig with my hands, so I ended up running for the shovel. If he hadn’t been stopped by some buried rock, I never would have caught him. I hadn’t realized that moles used that strategy to avoid capture. Now I know why a dog digs such a big hole when chasing a mole. This is the mole’s digging apparatus. Long, sharp claws loosen the dirt and the large, flattened feet push the dirt to the side. I wore gloves while holding the mole because those claws are sharp and a captured mole will try to dig through anything, even the palm of your hand. It has some nice sharp teeth, but I’ve never had a mole try to bite. The hind feet are smaller than the front, but they are also equipped with a nice set of claws. The mole anchors the hind feet as it digs and then pushes itself forward into the newly opened tunnel. The hind feet are also used to propel loose earth back and out of a tunnel. As I pursued the burrowing mole in its downward flight to freedom, the back feet fed out a constant supply of loose soil. Moles eat a variety of soil dwelling insects and worms. Surface tunnels are created in their search for food. This highly sensitive snout is used to detect potential prey items. The nose is highly animated and can be bent in any direction or retracted. Although it can move quite quickly on the surface, the mole isn’t designed for running in the open and moves with a rapid waddle. The mole is aided in its underground travels by an absence of guard hairs, the stiffer hair that makes up the coat of most mammals. The mole is covered completely in under fur, making it one of the softest of all mammals. There are two species of moles found at Blue Jay Barrens. 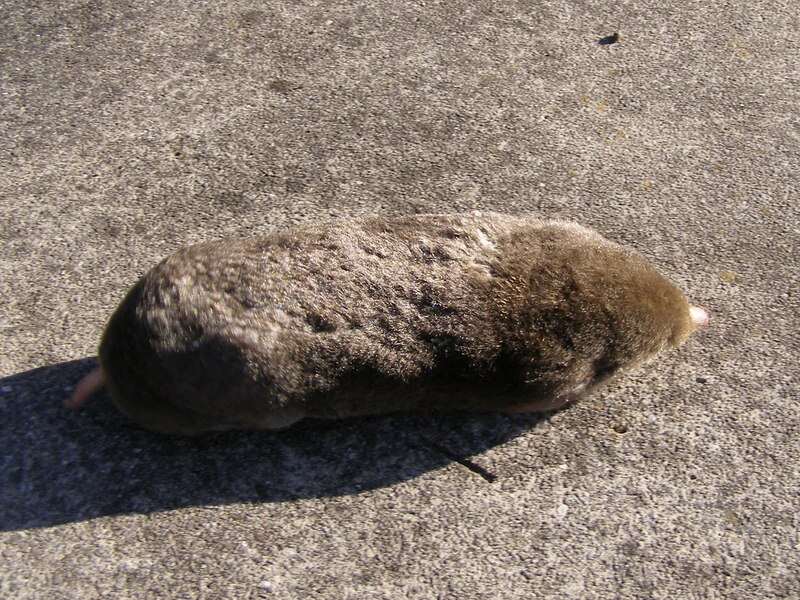 Shown here is the Eastern Mole characterized by the naked tail. The other is the Hairytail Mole which, as you have probably already surmised, has a hairy tail. This tail reminds me very much of those worms and grubs eaten by the mole. I guess they’re lucky the tunnels don’t allow them to turn around and find their own tails. The mole was released unharmed following the photo shoot. I don’t know what the title meant to you, but I’m referring to the growing of plants in pots. Growing plants in pots is an ideal way to learn about their various growth phases and changing appearance as they age. This is a pot full of Potato Dandelion, Krigia dandelion, one of the rarities here at Blue Jay Barrens. My first blog post was about the flowering stage of the plant and last summer, I posted about collecting the tubers. These plants began to emerge in December. Through the winter the leaves were short and round like those shown at the bottom of the photo. Lengthening daylight hours and warmer temperatures have prompted the production of longer, lobed leaves seen in the center of the photo. Growth will be very rapid for the next few weeks. This is one of my barrens pots. The soil is primarily pulverized limestone bedrock that I created when I dug my water garden. It’s a pretty fair mimic of barren conditions. This barrens pot is seeded with rare winter annuals. 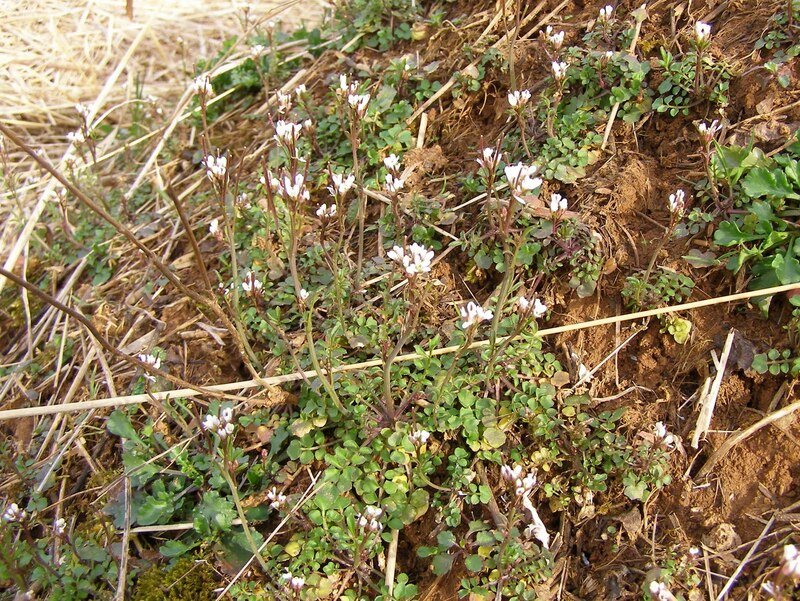 Here is Draba reptans. The Drabas have seeds that require a period of hot, dry weather followed by cool, damp weather before they will break dormancy and grow. The seeds of this plant mature in late spring and should be planted immediately. As a general rule, I’ve found that most wild seeds do best when planted at the same time of year you would normally find them falling to the ground in the wild. 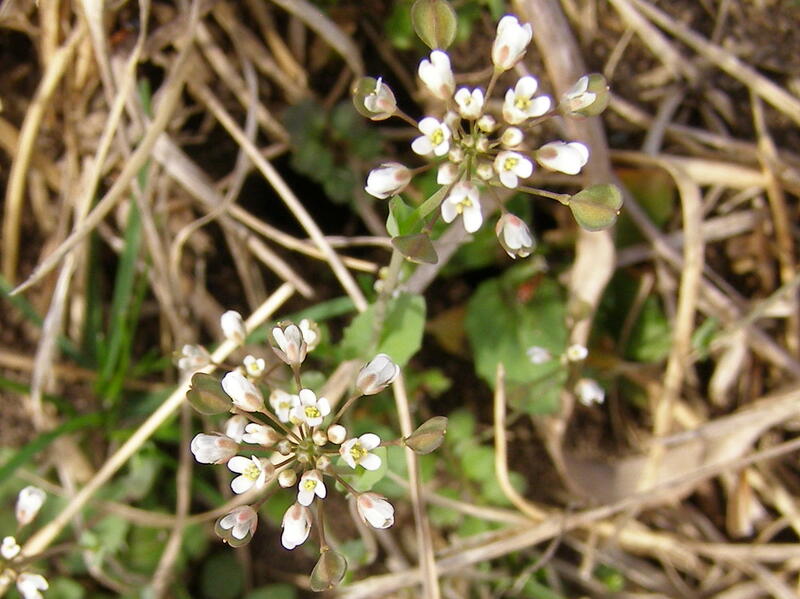 This is Draba cuneifolia. 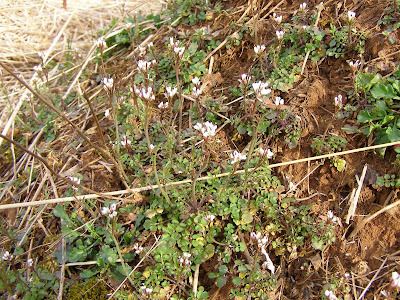 It is another small plant that is very similar to Draba reptans when it begins to grow. 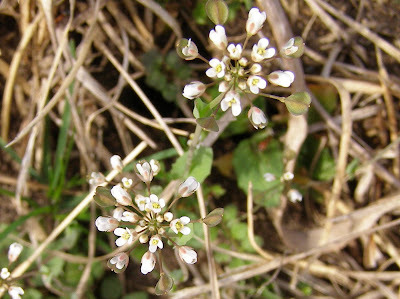 Its mature size is several times larger than Draba reptans and the later leaves develop a tiny, pointed lobe on each side. You can just see that this plant is beginning to develop those lobes. The problem with growing plants in pots is the fact that many respond too favorably to the slightly improved environment. This Leavenworthia uniflora has developed into an oversized monster compared to what grows in the wild. Wild plants are tiny and can barely manage a single flower stalk. This plant has massive leaves and a dozen flower stalks ready to shoot up from the center. This is nice if your goal is to produce seed that can be used to repopulate the plant into other areas. Turkeys were infrequent visitors to the feeders through the winter. During the past couple of weeks, a small group has been coming in every day. The older males have not yet begun courtship activities in earnest. In another week of two they’ll be too busy displaying to stop and eat. The colors of the turkey are at their best right now. The turkey molts all feathers except those that make up the beard. The beard continues to grow throughout the turkey’s life. It could grow to be much longer if the bird didn’t continually step on the end while feeding. Constant trampling keeps the end of the beard neatly trimmed. The deer destroyed this area during the winter and now the turkeys are smoothing it back out. Turkeys instinctively scratch the ground to uncover food. Even if food is clearly abundant on the surface, the turkey will periodically scratch. Scratching doesn’t hurt my yard, but large turkey flocks have been known to do some serious damage to leaf litter in the woods. This group is composed of males from one to three years old. If they follow the same pattern as past years, the older males will soon drive the younger out of the group and claim the yard as a display area. We had new windows put in recently and while they are a massive improvement over the 30 year old windows, they do cause a bit of distortion when trying to photograph through them. I really can’t complain. The old windows were steamed up all winter and when they were clear, the image you saw was like that of an amusement park mirror. I’ve shown what I found in the prairies and woods on my first day of spring walk, so now we’ll see what’s left in those areas that aren’t prairies or woods. 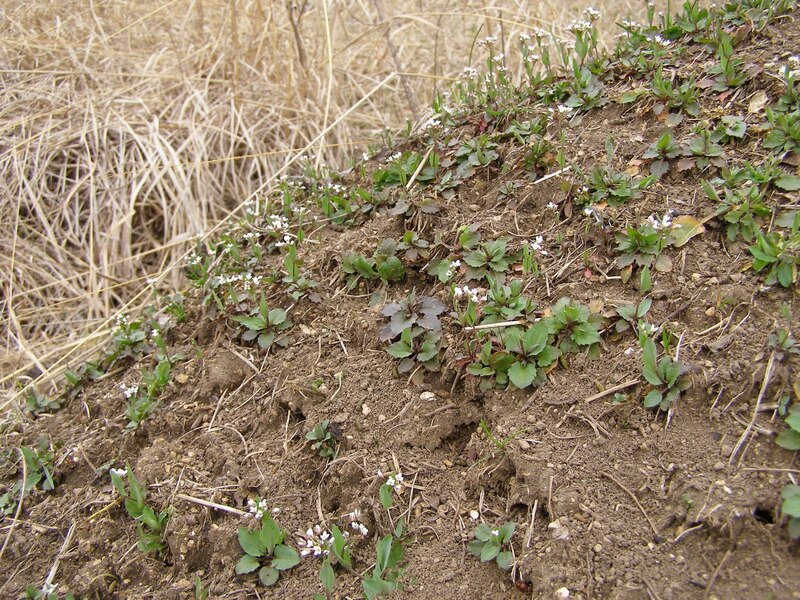 On the barrens, the Leavenworthia uniflora, one of the uncommon winter annuals, is preparing to bloom. 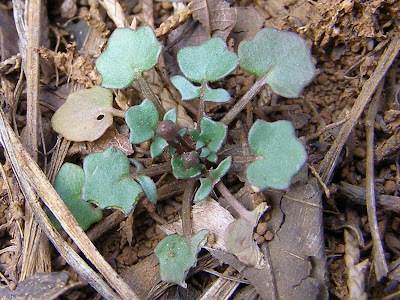 This plant is less than three quarters of an inch across and has been buried by snow, beat by heavy rains and suffered some gnawing on the leaves. The plant will hurriedly bloom and produce seeds before the barrens become too hot and dry for its survival. Here’s the skull of a Ground Hog that didn’t quite make it to hibernation. I often see Ground Hogs doing things that seem contrary to a well developed survival instinct and I wonder how any survive at all. Like other rodents, they seem to take advantage of every opportunity and increase their numbers at a rapid rate. 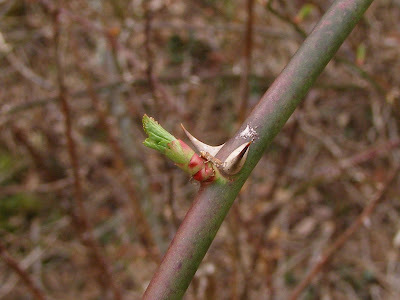 Multiflora Rose is beginning to leaf out. The pale green shoots are easy to see this time of year and remind me that I still have several more bushes to eliminate. 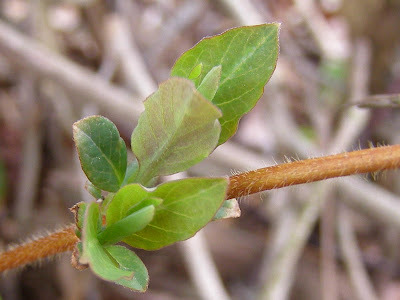 Japanese Honeysuckle is also producing new growth. It’s common for many invasive plant species to grow during times of native plant inactivity. Early spring growth allows invasive plants to shade the natives and gain a competitive advantage. 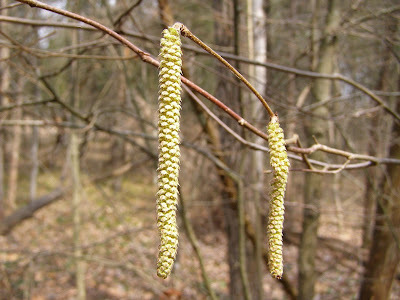 The Hazelnut catkins are nearly mature and will soon be dropping pollen. This Wild Black Cherry seems to be having a rough time of it. Growth deformities and oozing sap have made this a rather unattractive specimen. There were no insects attracted to the sap, so the taste must not be as appealing as that of the Sugar Maple. 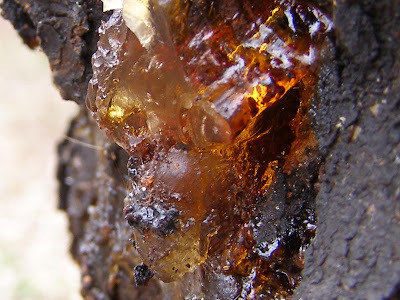 I wonder if this is the kind of sap that could one day become amber. The color makes it pretty in an ugly sort of way. I suppose you saw it anyway, but I just had to point it out. Who wouldn’t agree that this sap has the face of a bear? The only reason I see faces in everything, is because there are faces in everything. Except for the lack of snow, the woods aren’t showing much sign of progressing into spring. There’s still plenty of opportunity to view the trees before the leaves get in the way. The blanket of fallen leaves is still unbroken by emerging wildflowers. The leaves provide good insulation and the ground beneath is still quite cold. These leaves are the food supply for a vast number of woodland organisms. Leaves that covered the ground last spring have all been consumed and the nutrients passed back into the soil. Decomposition of the leaves is quite slow during the winter, but once things warm up, the leaves will begin to disappear quite rapidly. In another month the leaves will close off this view. The leaves will also provide shade and soundproofing, so this will develop into a cool, quiet place this summer. If this picture could show sound, you would notice the three most common sounds of the country; gunshots, 4 wheelers and chainsaws. Chainsaw noise is becoming less frequent, probably because it is a sound associated with work. A few Crows hurried over while I was sitting on a log. From the sound coming out of the cedars on the next ridge, I’d say these guys are late for a mobbing. Some poor owl or hawk is getting the full attention of every Crow within hearing distance. Signs of displaying turkeys are showing up in the leaf litter. Part of the male turkey’s display is dropping and vibrating the wings while making a short run in front of the female. The dragging wing tips scoot the leaves into short windrows. I found one area with a lot of fallen Post Oak leaves. I’ve only found one Post Oak on the property and these leaves were nowhere near that tree. I know that leaves can carry a long way in the wind, but it’s unlikely that these came from the tree I know about. Unless they blew a long way from a neighboring property, I suspect I have another Post Oak somewhere near. I’ll have to keep an eye out for it. I have a walking trail that crosses the creek in the shallow area just down from the exposed tree roots. Some parts of the trail system have bridges, but other parts require brief contact with creek water. It’s funny to watch people’s expressions change when they realize they may have to get a damp foot. If this was an amusement park, this is where I would situate a camera to produce souvenir photos of the creek crossing adventure.